Discover the joys of the Spanish Pyrenees in one of its most iconic regions surrounded by the largest collection of high mountains in the Pyrenees with rewarding (if pleasantly challenging) winter walking, while staying in a marvellously characterful hotel in a traditional mountain village. 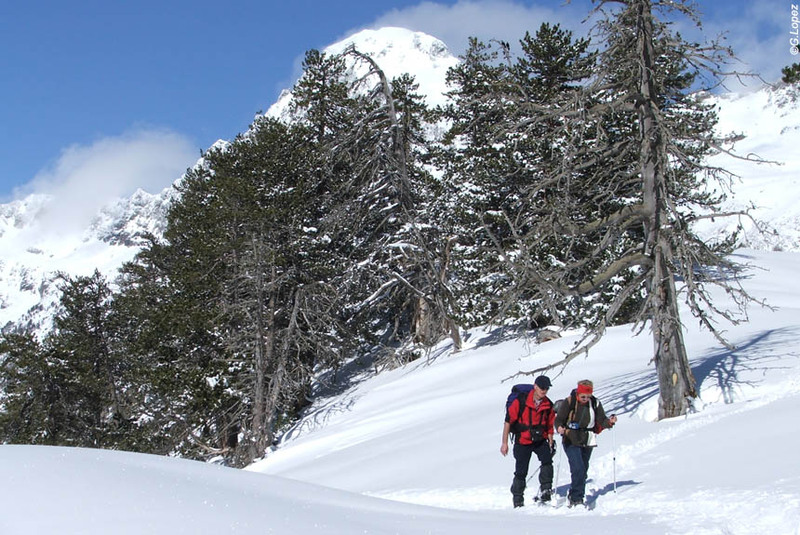 This winter walking with snow-shoes holiday takes you to the Aragonese heart of the Spanish Pyrenees. You stay in a highly scenic and unspoilt valley in an excellent hotel that offers just what you want from this inspiring mountains-in-winter environment. The walking is a more challenging than other of our holidays partly because you are surrounded by some of the highest Pyrenean peaks - including the very highest, Aneto. 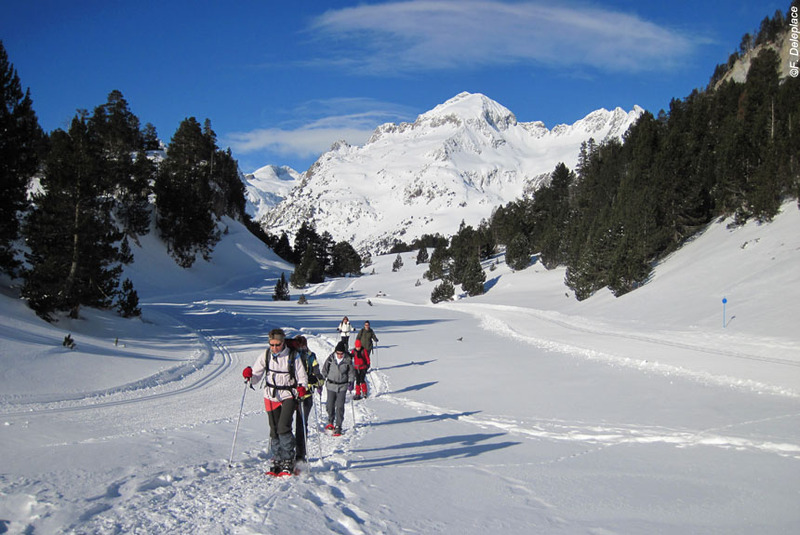 If you want to explore the Spanish Pyrenees in winter, then this holiday offers you the best possible experience of it. Saturdays: we meet you at Lourdes airport to take you to our hotel in Lourdes for this first night, or if you arrive by train (fast services), you can simply walk the 50 metres to the hotel. You are then free to explore the historic city of Lourdes. Alternatively, you can meet up at 09.00 the next day, Sunday, in Tarbes with the price adjusted accordingly. The comfortable three star Hotel Beauséjour is right in the city centre, and in easy walking distance of all places of interest. An early breakfast because your guide will pick you up at the hotel around 08.15 (or 09.00 in Tarbes) to first take you up into the Pyrenean heights for your snow-shoe lesson, then first walk. In truth - and unlike both downhill and cross-country skiing - it requires minimum equipment, little tutoring, negligible stress, and is easily picked up by simply doing it! You will find that it is far less physically demanding, and, therefore, far more enjoyable (spoiler alert; it is walking!). The walk is often beside frozen streams, waterfalls and small lakes in the wonderful Mulleres valley. yet high above you are the teeth-like summits of numerous mountains, not least the 11,000+ feet Aneto - the highest mountain in the French and Spanish Pyrenees. A truly memorable start to this winter walking experience lasting 4 hours with a cumulative ascent of 1,000 feet. 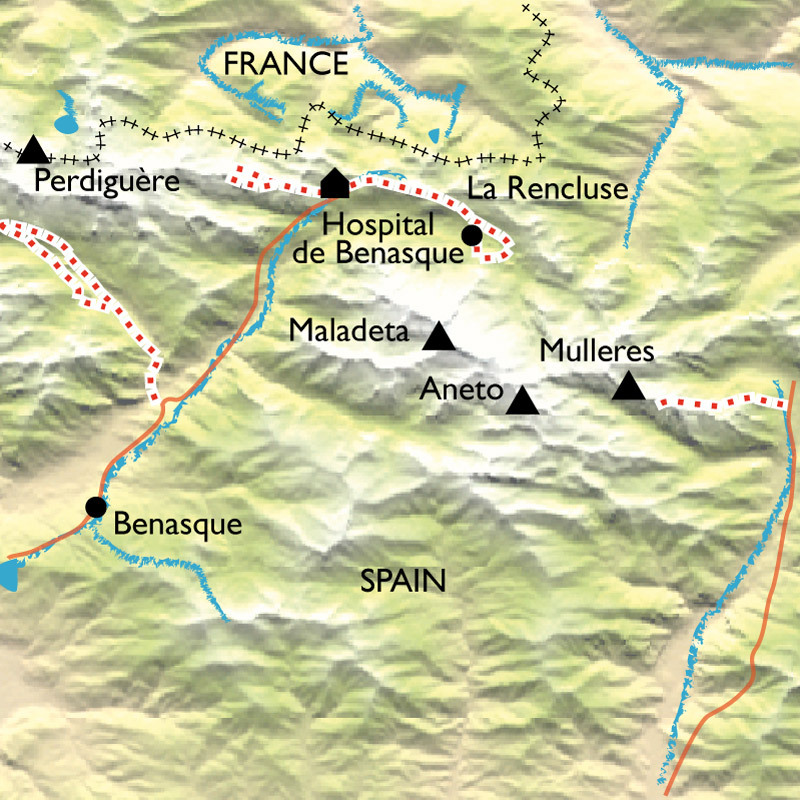 You then continue through the Viella tunnel into Spain, or, as many would have it, into Aragon, and the Benasque valley. Benasque is at the heart of the spectacularly stunning landscape of the Posets-Maladeta Natural Park, which has the highest concentration of peaks of more than 3,000 metres in the Pyrenees, 13 glaciers, 95 lakes, and innumerable waterfalls, many of great beauty, plus rivers, streams, meadows and traditional Arogonese villages. The wonderful 3 star Hotel Hospital de Benasque in French is the Llanos del Hospital in Spanish, and is everything you would want and expect in terms of location, views, surrounding village, stone built character, warm and comfortable mountain styled interior, good quality rooms and excellent regional cuisine. That's why we love it so much! We're sure you'll be pleased that you are staying here for 5 nights. Today you put your snow-shoes on at the hotel door to discover just how beautiful your "home" valley is, and what a paradise it is for winter walking. You walk along the valley floor through small forests, over what in summer are wildflower meadows, across footbridges, alongside frozen streams, beside frozen waterfalls, and across frozen lakes as well as a series of plateaux with exceptional views at almost every step. The sheer magnificent majesty of the Pyrenees is high above you all the time with Aneto almost always dominant, yet as you return the pyramidal Tuc de Literole will undoubtedly demand at least one photograph, but probably several. On your return, you may find the hotel's Turkish baths and jacuzzis as welcome as the fine dinner that awaits you afterwards - and the damn good night's sleep after that! Walking time: 5 hours. Elevation: + 500m / - 500m. You also start today from the hotel door, but go in another direction to discover the delights of the lakes of Remune - justly renowned throughout Spain and beyond, but only safely explored in winter with a highly experienced guide like yours. You initially walk through pine woods, but as you gradually get higher you walk on paths climbing the sides of the dramatic and forbidding Pic de Remuñe, which is in sharp contrast to the gently idyllic valley landscapes below, the lakes you see and visit, and in competion with the many peaks all around - some austere, some almost architectural, some simply beautiful. Walking among them in the snow enhanced tranquillity really is an immense privilege, and, perhaps, also the perfect antidote to our crush-and-rush daily lives. The Turkish baths and jacuzzis might well be beckoning again. For a change, there is a 30 minute transfer to discover the pretty amazing Estos valley. 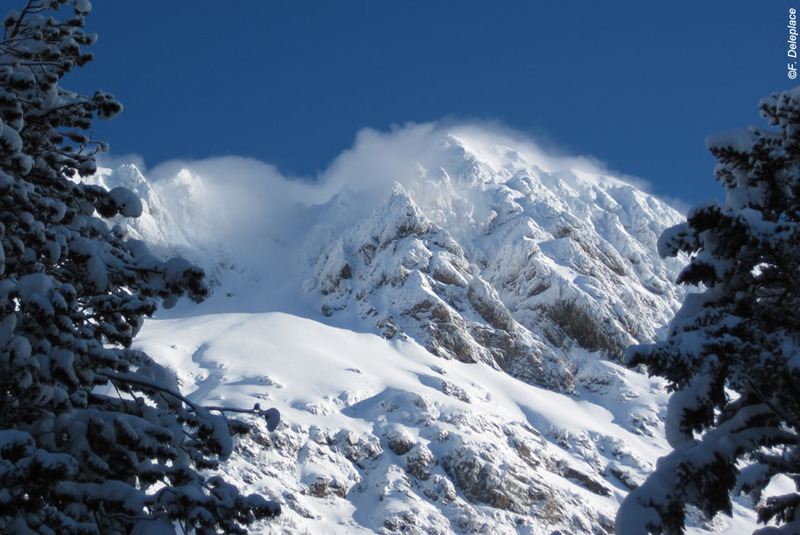 The route follows the bottom of the valley with the imposing summits of Perdiguère on one side, and Gourgs Blancs on the other,and the 11,000 feet Posets in front of you. 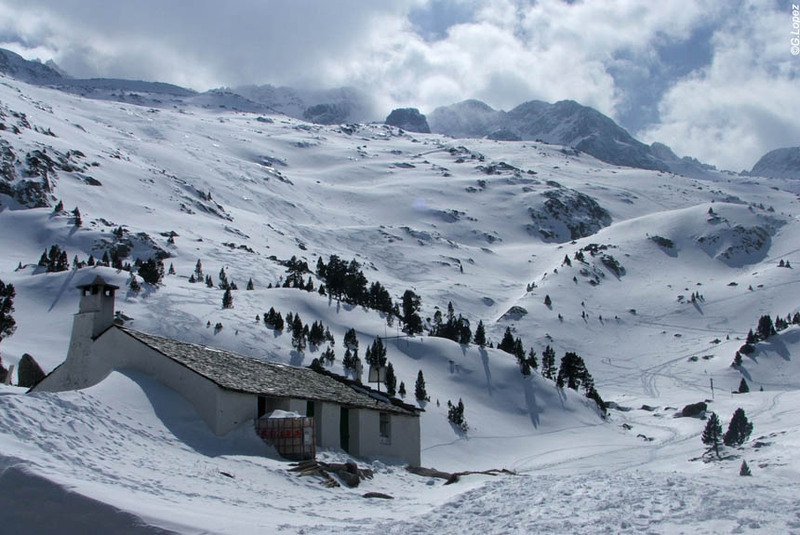 If time, weather and energy permit, you will all walk up to the 6,000 feet Estos mountain refuge, and return along the southern side of La Coma mountain before visiting Benasque village on the way back to your hotel. An excellent day of winter walking and Pyrenean appreciation! The natural rhythm of life may have asserted itself by now: good breakfast, fantastic walk, welcome snooze, well-earned spa experience, interesting aperitif, satisfying dinner, deep sleep. Just what holidays are all about. Your last walk will leave from the hotel door, and take you up high up into the mountains towards the refuge of La Rencluse under the peaks of Maladeta and the ever-present Aneto. This magnificent environment wraps itself all around you, so there are superb and very rewarding walks in almost every direction. You may go to the lovely Paderna valley and lake in the metaphorical shadow of the Pic d'Alba, but this will depend on weather and snow conditions as well as the group's preferences. What we are sure of is that this will be a memorable last day among a collection of memorable days. Sorry last night at "the Hospital", but, like your last walk, we are sure it will be a truly memorable, happy and sad one. After breakfast, it's time to return to France, and spend your last night (with dinner) at our preferred hotel in Tarbes - an interesting and historic town with the magnificent national stud and stables, park and adjacent Massey gardens founded in 1806 by Napoleon undoubtedly a highlight (whether you are interested in horses or not). The chic, contemporary and very French 4 star le Rex is located perfectly in Place Verdun in the centre of town with shops and historic streets all around. Dinner and breakfast are included. However, if you are not taking the Saturday flight back to London, you can choose not to stay the night with the price lowered accordingly. After breakfast, the hotel can arrange for a taxi to take you on the short trip to Tarbes train station, or Tarbes-Lourdes airport in time for the London flight, or you can make your own arrangements. This holiday has a fluent English speaking guide as well as being for French speakers. It starts on Saturdays to coincide with the weekly flight from London Stansted to Lourdes - by far the lowest cost, fastest and most direct journey from the UK. You will almost certainly need to be in Lourdes over night as the group leaves at 08.15 on Sunday morning from the hotel, or at 09.00 be at Tarbes station. On the Saturday morning after breakfast at the hotel in Tarbes, or if you chose to finish your trip on the Friday, we leave you at Tarbes railway station at 13h. 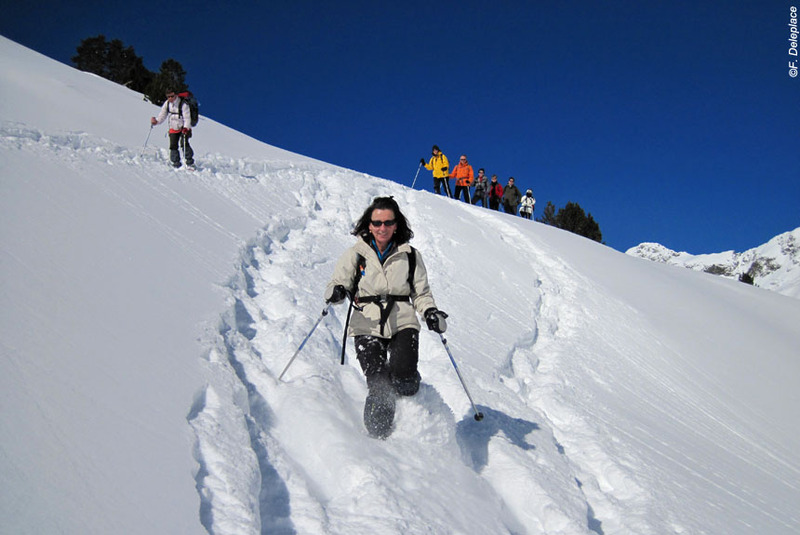 Each day the time spent on your snow-shoe walking journey will be around 5 hours including rests etc. The cumulative daily ascent/descent will range from 300 to 880 metres (1,000 to almost 3,000 feet). This is the equivalent to fairly challenging summer walking, and is intended for people who are reasonably fit and used to extended periods of activity. On some days, there are shorter and longer options, sometimes dependent on weather and snow conditions. We have found that our customers really enjoy being in a small group that includes both English and French speakers. The minimum group size is 5, and the maximum is 15. There is no minimum/maximum for English speakers. The guide will speak at least good conversational English, and usually speak fluent English, or be bi-lingual. He or she will also be a highly experienced winter walking guide. The accommodation consists of: one night in a 3 star hotel in Lourdes; 5 nights in an exceptional 3 star hotel in Benasque; one night in a 4 star hotel in Tarbes. Meals: continental style breakfast at the Lourdes hotel, and each morning thereafter. The restaurants offer a menu of local gastonomic specialities for you to choose from. Hotel supplied picnics for each walking day are also included. Wine and other drinks are not included in the holiday price.